This sweet treat recipe is inspired by the Banana Fritters with Chocolate & Cheese that’s sold at the pasar malam here in Singapore. The only difference is that there’s no deep frying involved for this recipe as I just want to keep this a little lighter and healthier which is also a great way to eat more bananas (if you don’t quite like them in the first place). I suggest that you use ripe (or even overripe) bananas as their sweetness stands out even more after being grilled/baked in the oven. 1. Preheat oven to 180 deg C on Grill mode. 2. Halved the bananas lengthwise and arrange them on a baking dish. 3. 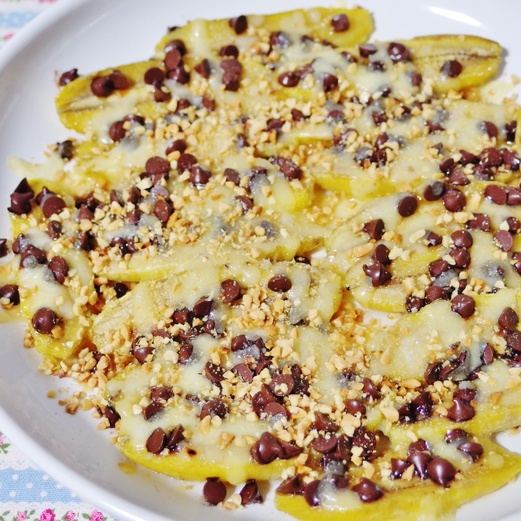 Sprinkle chocolate chips and cheese over the bananas. 4. Bake in the highest shelf of oven for about 7-8 minutes or till the cheese has melted. 5. Sprinkle ground peanuts on top and enjoy!